Is it true that if you just ignore an old debt it will go away? Not exactly. 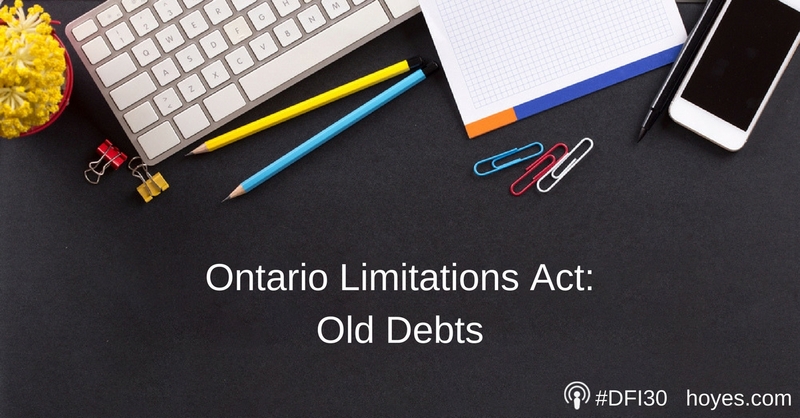 There are a few misconceptions about the Ontario Limitations Act. This week’s Technical Tidbits edition of Debt Free in 30 will help separate the fact from fiction. We all know that if you don’t pay a debt, you will get collection calls and, perhaps, have your wages garnisheed. So yes you can ignore a debt, but it may lead to collection actions. Doing nothing isn’t generally a good option. If you don’t have a job, you don’t need to worry about wage garnishments. But that doesn’t mean that you can simply ignore a debt and have it go away. If you have no wages to garnishee, or no assets to seize, there many be no benefit to a creditor or debt collection agency taking you to court and suing you. So yes, you could just ignore the debt and not suffer direct financial consequences. The debt didn’t go away, you still owe the money. If a bank or credit card company can’t take collection action against you, it’s as though the debt has no impact on your financial life. But the debt is still there, and is still owed. The key point here is that you have a job, or assets, doing nothing is not a good strategy because you have something worth protecting. What is an old debt? 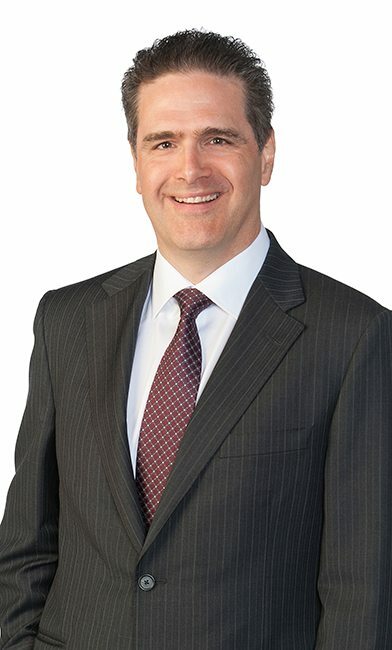 Section 4 of the Ontario Limitations Act states: a proceeding shall not be commenced in respect of a claim after the second anniversary of the day on which the claim was discovered. This is an over-simplified explanation on debt collection statue of limitations but, in simple terms, if you have not made any payments on a debt for two years, a creditor is not allowed to commence legal action against you. The debt is “old”, and the court does not want court actions for old debts. If you have a debt with no activity for more than two years, and if a creditor was to sue you, you could file a Statement of Defense saying the debt is past the limitations period. Of course, if you don’t defend yourself, the creditor could still get a judgement as the judge may not know it is an old debt. It’s important that you don’t ignore your legal paperwork if you are threatened with legal action. Another definition of an “old” debt is six years, which is the purge period from your Equifax credit report. The purge period is when information is automatically removed from your credit report. This happens six years after the last activity date. So, if you make no payments on a debt for six years, that debt will no longer appear on your credit report. NOTE: This does not mean that you do not owe the debt. It simply means that it no longer appears on your credit report, therefore not impacting your credit score. If you owed that money to ABC bank and six years later tried to borrow money for them again, they’ll still have a record of what you owed on file. It’s likely they’ll think twice before lending you money again. The description above applies to standard debts like credit cards and bank loans. Government enforced debts are not subject to the two year limitation period. In most cases government debts do not appear on your credit report, so there is nothing to purge after the six year time frame. In other words, government debts don’t go away. Other debts like 407 ETR debts and a CMHC mortgage shortfalls can get complicated. Listen to the podcast to hear more. The experts at Hoyes Michalos are here to review your debts and advise you on which actions you should take to deal with your debt. Whether they’re old or not. Book your free consultation today so we can help you make a plan to deal with your debts. Doug Hoyes: My firm, Hoyes Michalos & Associates posts a lot of information on 310Plan Facebook page and we get lots of comments. Obviously most of the stuff that we post is about debt so we get lots of people commenting on how to avoid paying debt without going bankrupt or filing a consumer proposal. It’s very common for a commentator on our Facebook page to say something like don’t worry, if your debt is old you don’t have to pay it, it just goes away. Well, is that true? What actually happens to old debts? Do you have to pay them? Well, those are the questions I’m going to answer today on this Technical Tidbits edition of Debt Free in 30. Now before we discuss what happens to old debts let’s start with a more basic question, what exactly is an old debt? Well, there are three possible answers to that question. It could be any debt that’s passed due, it could be any debt that’s more than two years old or it could be any debt that’s more than six years old. Now why are those two years and six years time limits important? Well, let’s talk about the lifecycle of a debt. So, let’s say you’ve got a standard unsecured debt, a credit card debt, a bank loan. We’re not talking about car loans or mortgages, that would be a special case. But a standard unsecured debt and you’re not able to pay it. So, what happens? Well, you miss the first payment and the original credit, the bank, will send you a letter, they’ll call you, they’ll ask for their money. If after two or three months they’re not getting anywhere with you, maybe three of four months, they will turn the debt over to a third party collection agency. The bank doesn’t want to be collecting from you forever, they turn it over to a collection agency. So, I guess you could say well at that point my debt is starting to get old because it’s no longer with the original bank. Legally there’s no difference between a debt that’s one month or six months old. If you want to know more about how to deal with third part collection agents, how to deal with collection agencies in general, we’ve got lots of information on our hoyes.com website. I did a podcast with a collection agent, Blair Demarco Wettlaufer, that was podcast number 20. So, if you got hoyes.com and search for collection agents you’ll see all sorts of information in how to deal with them. Let’s take a look at a second case where a debt that is more than two years old. This is a much more special case because in Ontario we have something called The Ontario Limitations Act. Under the Ontario Limitations Act, and again I’ll put links to this in the show notes over at hoyes.com, section four of the limitations act says unless this act provides otherwise a proceeding shall not be commenced in respect of a claim after the second anniversary of the day on which the claim was discovered. Okay, that’s a bunch of legal mumbo jumbo. What does that actually mean? It means that once a debt is two years old, it is very difficult for a credit to sue you for that debt. When does this two year start? Well, if you look at subsection five sub three it says for the purposes of sub clause 1 A, the day on which the injury, loss or damage occurs in relation to a demand obligation is the first day on which there is a failure to perform the obligation once a demand for the performance is made. Now I’m not a lawyer and you should not construe anything I say as legal advice. I will tell you my interpretation of what that phrase means and you can investigate it for yourself. But in common usage it means the two years starts when you fail to perform your obligations which is when you fail to make a payment. So, if you are supposed to be making a payment every month and you stop making payments, then the two year clock starts at the time of your last payment. Or what would show up on your credit report as the last activity date. So, it’s not when you got the loan that matters, it’s when you stopped performing your obligations. It’s when you stopped paying it that matters. So, for the purposes of this two year rule, if you haven’t made a payment for two years, then it is outside the limitations period. Now the Act says that again, I quote from section four, a proceeding shall not be commenced. In other words, a creditor is not supposed to sue you for a debt that is more than two years old, or more specifically for a debt where no payments have been made in more than two years when they should have been made. In real life what that means is if you have not made payments in two years and if a creditor sues you, even though the act says they’re not supposed to, you would be required to defend the action. Either by filing a statement of defence with the court or more likely actually showing up in court on the date of the court action, the trial. It would probably be small claims court, you’d show up in court and say to the judge, hey judge the last activity date on this debt was more than two years ago, therefore according to the Ontario Limitations Act, they should not be able to sue me. That’s how the Limitations Act works. Yes, it is supposed to prevent creditors from suing you but if a creditor does sue you and the judge doesn’t know that the debt is more than two years old and the judge doesn’t know to ask, then they still could get a judgment against you so you must defend yourself. That’s the key point about the two year rule. So, if you have a debt where you’ve not made payments for more than two years, then the Limitations Act works to your advantage. Now I said that there were three time periods that mattered, when it goes to collections, well we’ve already talked about that The Ontario Limitations period, which is two years and it’s different in other provinces. There’s also your credit report, information stays on your Equifax credit report for, in general, six years. More specifically old information is purged from your credit report after six years. So, when you get a copy of your credit report, most of the debts listed will have a last activity date. If the date is more than six years old, the information in general is automatically purged. Because there’s no point in having information on your credit report that is more than six years old, there’s really no point. So, that does not mean you don’t owe the debt, it just means that it doesn’t show up on your credit report. That’s the difference between the two years and the six years. So, before I explain what all this means in the big picture, let me tell you that there some exceptions to all this, things like tax debt for example are not subject to any limitations period, if you owe the government, you owe the government. And the only way you don’t owe them is if you pay them or if you file a bankruptcy or a consumer proposal, that’s it. So, tax debt is not subject to the limitations period. Student loan debt, same thing, there are special rules that government debt, student loan debt being one of them and in fact as a general rule, any kind of government debt is not subject to the two year limitation period. Things like parking tickets, speeding, tickets, those are all government related debts, they’re not subject to the limitations period. Alimony and child support, same thing. If you owe it, you owe it. It doesn’t matter how old it is, you still owe it. Another example of a government debt would be like a CMHC shortfall on a house. So, there are debts that are not included in the limitations period. If you have old debts it’s good to get professional advice, talk to a Licensed Insolvency Trustee, talk to a lawyer and figure out whether your debts apply or not. So, let’s summarize this by looking at what the whole point is. So, the point is this. Just because a debt is old, does not mean it goes away. Just because a collection agency is calling you, doesn’t mean you don’t have to pay, they’re still going to keep calling you. Just because a debt is over two years old, you still owe the debt. All that means is if the creditor was to take you to court and sue you, your defence, if you made one, would be that the debt is past the limitations period. You still owe the debt, they just can’t legally collect it from you by getting a judgement in court. If a debt is more than six years old, it likely will not show up on your credit report. It doesn’t mean you don’t owe the debt, it just means at that point they can’t really sue you for it and it’s probably not showing up on your credit report. And again, there are certain debts that are not – that don’t follow with these rules. So, if it’s a normal debt, like a credit card and it’s been more than two years since you last used the card or made a payment, it is still possible that the creditor could sue you. If they do, you have to appear in court to defend yourself and your defence would be that the debt is older than the limitation period. And assuming the judge knows the law, the creditor won’t be able to get a judgment against you. The key point is that if you are sued for an old debt, you have to defend yourself or else the creditor is likely to get a summary judgment against you even if the debt is old because the court may not realize that it’s an old debt if you aren’t there to tell them. The bank may not be able to get a judgment against you if it’s been more than two years since you made a payment but you still owe the debt and it still appears on your credit report. If it’s a government debt like taxes or a student loan or a CHMC shortfall on a house, it never goes away. CRA can keep taking your tax refunds and taking other action until the debt is paid. So, if you have old debts, don’t just assume you can do nothing. Don’t believe everything you read on a Facebook page, contact an expert, a Licensed Insolvency Trustee for the real answer in your situation. We may advise you to do nothing. We may say hey, look, you’re on a pension, you don’t have any assets, it doesn’t matter that it appears on your credit report, don’t worry about it. On the other hand you may say hey but I want to be re-establishing my credit, I want to be financing a car, buying a house in the future, I want my credit to be cleaned up. Well, if you’ve got a two year old debt on your credit report, even though you can’t be sued for it probably, it’s still showing up on your credit report, it’s still negatively impacting your credit score, it may be a good idea to file a bankruptcy or a consumer proposal to deal with it. Or there may be many other options to deal with it. Maybe you can make a settlement directly with a creditor. The point is there are lots of different options, don’t just assume that the do nothing option is correct for you. It might be, and if it is we’ll tell you, but if there are other options, you want to consider them. That’s the point. 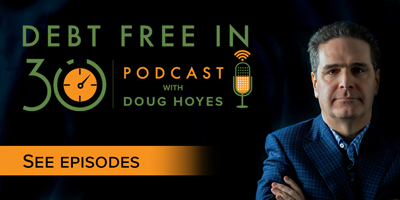 That’s our show for today, full show notes can be found on our website at hoyes.com that’s h-o-y-e-s-dot-com, including a link to the Ontario Limitations Act and a list of all of our Licensed Insolvency Trustees who can help you make a plan to deal with your old and your new debts. Thanks for listening. Until next week, I’m Doug Hoyes. That was Debt Free in 30. How Long Can You Run From Your Debt? And Should You? What Can I Do If I Can’t Pay My Student Loans?